The Job Editor tab is used to create a new job and corresponding tasks. The Job Editor table can also be used to view the history, status, and log data for each task. Job name — a unique, human-readable name for the job. Description — a detailed description of the purpose of the job. 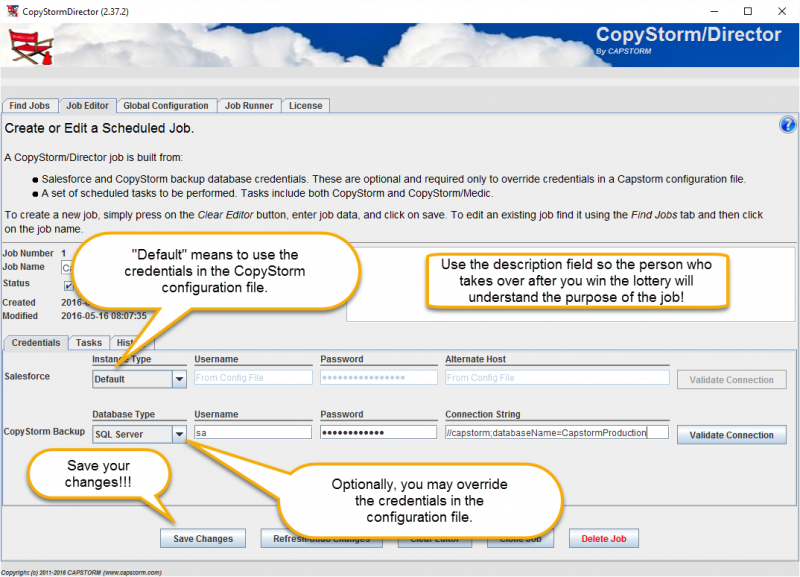 If the “Active” box is not checked the tasks in the job will not be ran by CopyStorm/JobRunner. 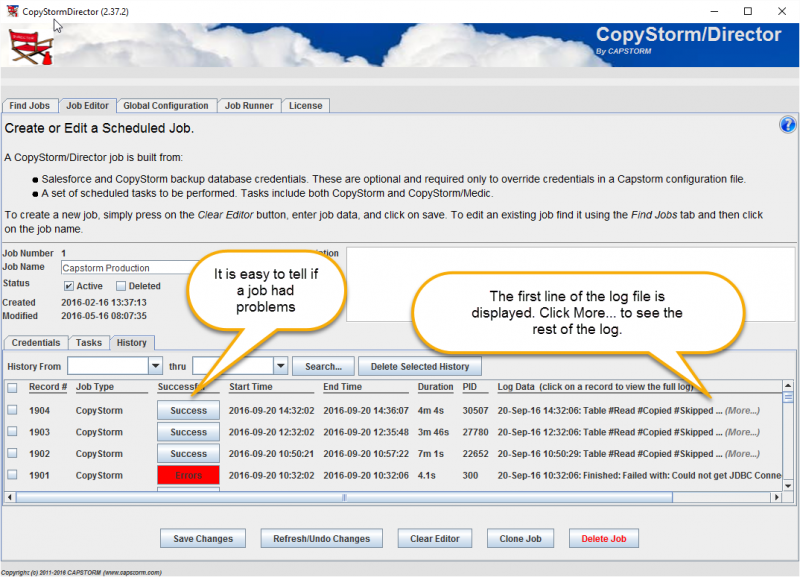 If the “Deleted” box is checked the job will be considered deleted but still kept in the CopyStorm/Director database. After entering a name and description, the next step is to enter credentials for both the Salesforce instance and the CopyStorm database associated with the job. 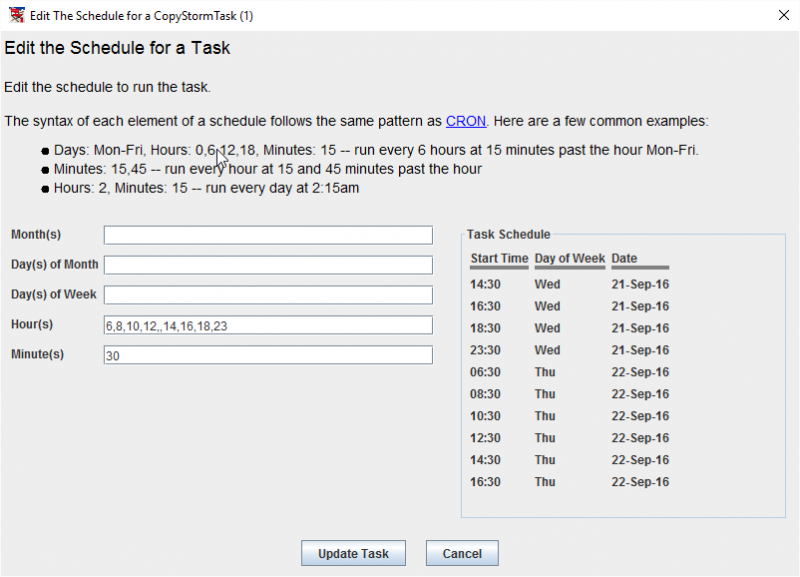 The run schedule for a task is set using the Schedule Editor. Click on the “Actions…” button to launch this editor. Parameters on the left of the dialog control when a task should run. For help on the format click on the CRON link in the help part of the dialog. As you enter scheduling constraints the system will display the computed schedule on the right-hand side of the dialog. Note that nothing is saved unless you click on the “Update Task” button. 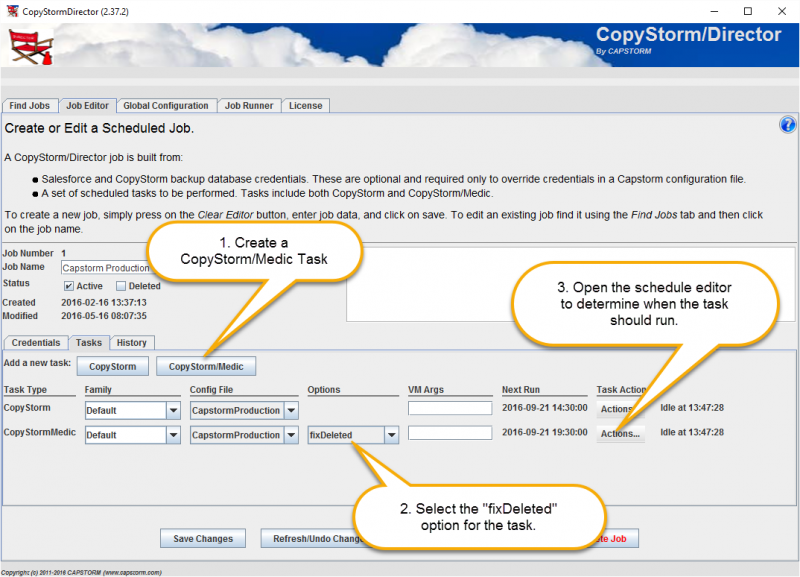 Adding a CopyStorm/Medic task follows the same procedure with one extra required parameter. The extra parameter is used to specify the CopyStorm/Medic tool to run. “Show Schedule” shows a read-only version of the schedule for the next 10 runs of the job. “Edit Schedule” displays the Schedule Editor for the task. 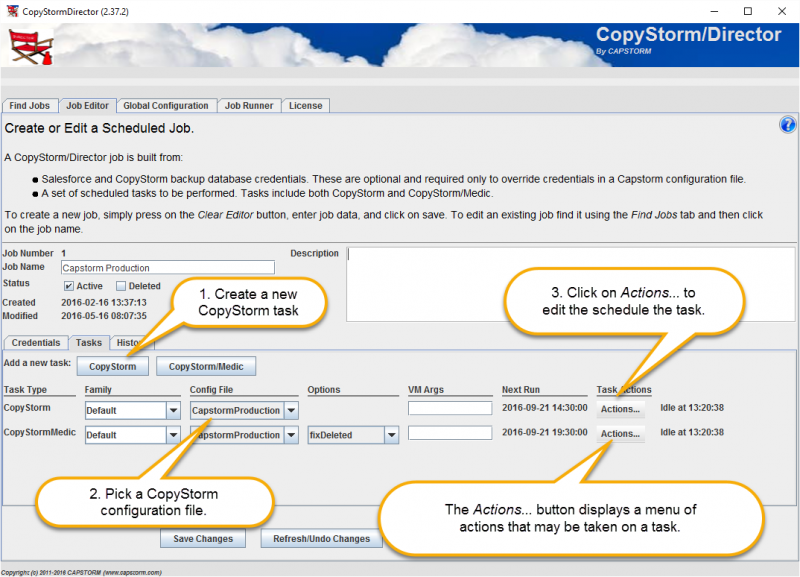 “Run CopyStorm GUI” launches the CopyStorm application using the configuration file associated with the task. “Start Task” starts the task as a background job. The background job will continue to run if the CopyStorm/Director application is closed. “Stop Running Task” stops the background process running this task. This option is disabled if the task is not running. “Delete Task” removes the task from the job. The History tab displays the results of each task execution. The date range of tasks displayed can be changed using the “History From … thru” editor.